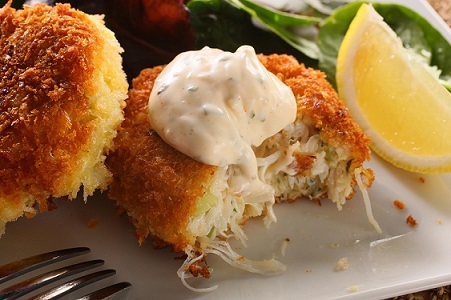 This Crab Cake Recipe puts the legendary Maryland crab cakes to the test! 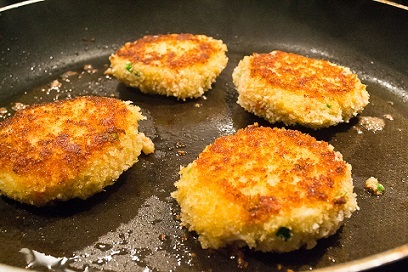 Crab cakes (also once known as "fry crab," "crab mince," "dress crab," "crab croquettes" and, later, "crab patties") are considered a traditional Maryland specialty. 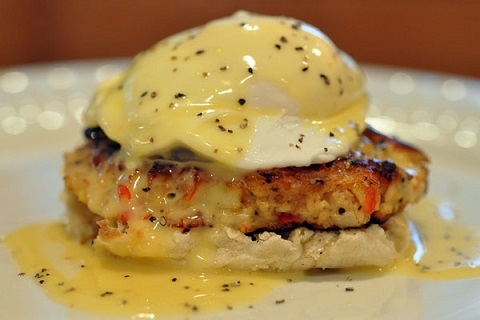 Simply put, a crab cake is a sautéed or fried patty of crab meat. There is no denying that crab recipes, like this crab cake recipe, were popular in Colonial times. The recipes were introduced to the area by English settlers. The term, "crab cakes," was introduced about 1930 and it stuck. 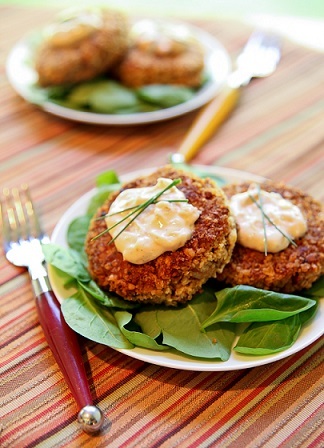 Crab cakes can be served as an appetizer (when down sized), entree or as a sandwich. Crab burgers are eaten on a hamburger bun. Condiments can include cocktail sauce, tartar sauce, mustard, Worcestershire sauce or a secret restaurant sauce recipe such as a roasted red pepper sauce. For many years, Maryland and other Chesapeake Bay areas have claimed to have the best crab cakes anywhere. The claim may be disputed by some today, but for a long time Maryland had two things working to support the claim - history and Blue crabs. Lump crab meat, referred to in many recipes, is the market name for the lumps of white crab meat (most often from the legs, I believe) with no shell or cartilage. Known for its sweet taste and hearty texture, the meat from the blue crab is very good. Dungeness crab is what I use most often for taste and because of its availability where I live. In the Florida area, Stone Crabs are often used. Crab recipes have been very popular on the East Coast since settlers began arriving (yes, Native Americans ate crabs prior to this) for two reasons: taste and economy. It is hard to believe, but at one time, crab was so abundant it was easy to acquire. "Crab Cakes Baltimore" is a crab cake recipe as originally written in 1932 and it comes from the Lord Baltimore Hotel. Take one pound of crab meat for each four crab cakes. Put crab meat into mixing bowl, add one and one-half teaspoons salt, and two teaspoons white pepper, one teaspoon English dry mustard and two teaspoons Worcestershire sauce, one yolk of egg and one soup spoon cream sauce or mayonnaise, one teaspoon chopped parsley. Mix well, making four crab cakes, press hard together, dip into flour, then into beaten eggs, then into bread crumbs. Fry them in hot grease pan." This recipe is really the basis for most recipes written since, including the one my restaurant guests have voted as a favorite restaurant recipe for crab cakes. Whatever crab you use, make certain to rinse and pick over the crab meat, discarding any pieces of shell or cartilage you may find. Try to leave lumps as large as possible. Preparation time: 15-20 minutes. Makes 16 cakes for appetizers. Makes 8 cakes for an entree. Enjoy your crab cake recipe and the company of those you share it with! Enjoy all the real restaurant recipes on the web site. You can cook with confidence and style. Did you know? 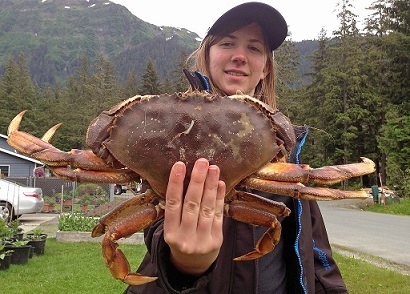 Seafood Watch has given the Dungeness crab a sustainable seafood rating of 'Best Choice'.